Okay friend – the title was your warning! If you don’t want an early sneak peek of the upcoming new products for Sale-A-Bration – available Feb. 16th – March 31st – then close this post now!! On the other hand, if you’ve been wondering and waiting, then this post is for you! Okay, those that didn’t want to see the sneak peek should be gone now…..so here they are! Drumroll please……. TA-DA!! 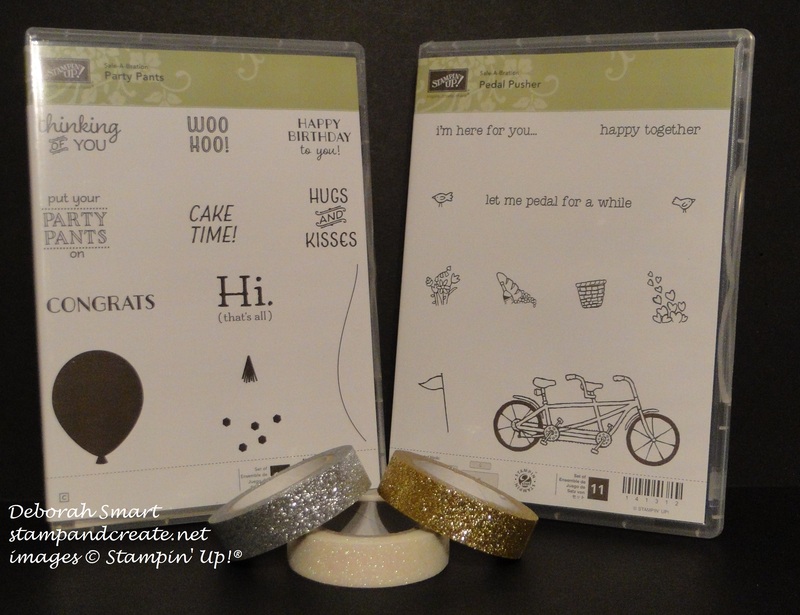 Here they are; 2 fabulous new stamp sets, and a trio of glitter tape! The first stamp set (on the left) is called Party Pants (I love that name!) and it’s a great party set that can be used for any party occasion, not just birthdays. The balloon image also coordinates with our fabulous Balloon Punch – isn’t that great!? 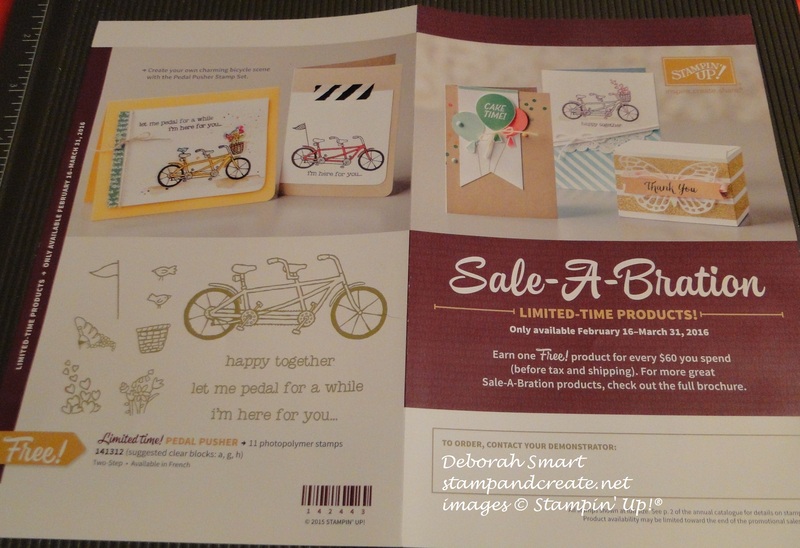 The second stamp set (on the right) is called Pedal Pusher, with the main image being the super cute bicycle built for two, with the flag, basket and all the things that fill the basket, for any occasion you want! I just adore this set; it reminds me of the ‘Loaded with Love’ retired set – with the open back truck, and the stamps with things that could fill the back of the truck; do you remember that one? It was so popular, and to this day I still have people asking for it. I think that this bicycle set is going to be just as sought-after! 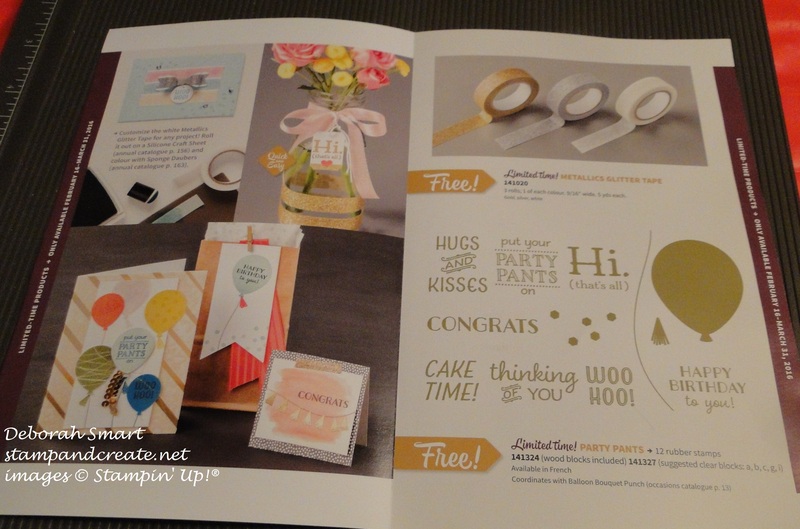 Is your head spinning with ideas on how to use these new stamp sets and tape?! Mine is! You have from now until Feb. 15th to get the Sky is the Limit stamp set, the Perfectly Artistic DSP and the Hello stamp set, which are currently on the last 3 pages of the SAB brochure. On Feb. 16th, these 3 items go away, and are replaced with the new Party Pants and Pedal Pusher stamp sets and the Metallics Glitter Tape. So get your shopping list ready, and CLICK HERE to go directly to my online store! If you have any questions, or if you’d like me to put in your order for you, give me a call at 604.298.0472 or email me at debsmart@shaw.ca and I’ll look after you.